When you’re in it, the chaos of Hanoi’s streets can feel overwhelming. But when you’re above it looking down, it’s definitely a beautiful thing. So if you want to get above the crowds and enjoy a drink with some comparative peace and quiet, give these Hanoi rooftop bars a look. Hanoi’s rooftop scene isn’t quite as varied as your options in Saigon, but I’ve still discovered a number of quality options. Most of these rooftop bars are more a place where you go to have some drinks with friends, rather than an all night party. On my next trip to Saigon, I plan to investigate the issue there. 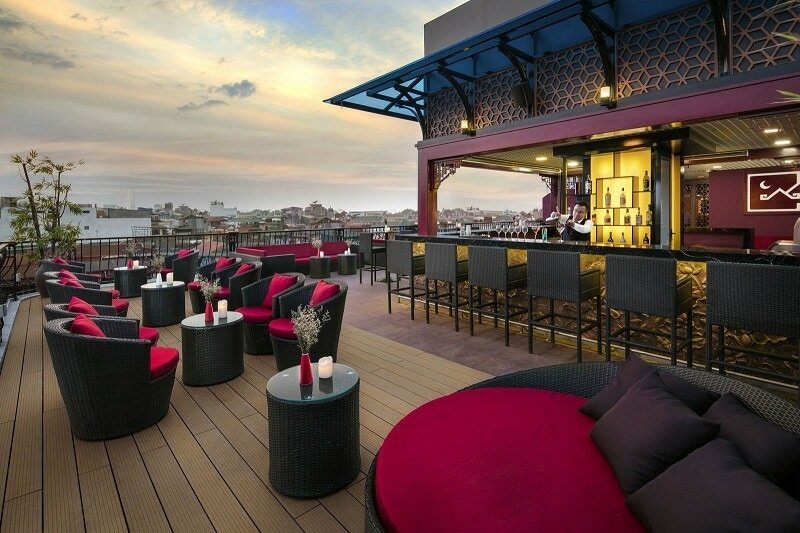 But for now, here are the best rooftop bars that I’ve found in Hanoi, Vietnam. To give you an idea of where you can find most of these bars, I’ve marked their locations on a Google map. Hope it helps! Most are easily accessible from Hanoi’s Old Quarter. 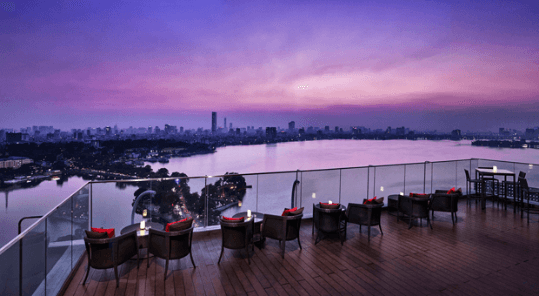 Located on the top of the Sofitel Hotel, Summit Lounge looks out over Thanh Nien street and two different lakes (Tay Ho and Truc Bach). Thanh Nien is one of the most beautiful streets in Hanoi. It’s a tree-lined, picturesque dagger that cuts between those two lakes. Of all the rooftop bars in Hanoi, Summit Lounge definitely has the best view. As a consequence, the prices might make you forget that you’re in Vietnam. They’re not horrible – but expect to pay ~190k VND for a classic cocktail ($9). The cheapest domestic beers run 90k VND (~$4.50). If you’re just traveling in Hanoi, Trill Rooftop Cafe might be a little hard to get to because it’s far away from the tourist area. But if you do make the trip, I promise you that it’s worth it. Located on the 26th floor of the Hei Tower, Trill Rooftop Cafe boasts breathtaking city views as well as…a swimming pool! 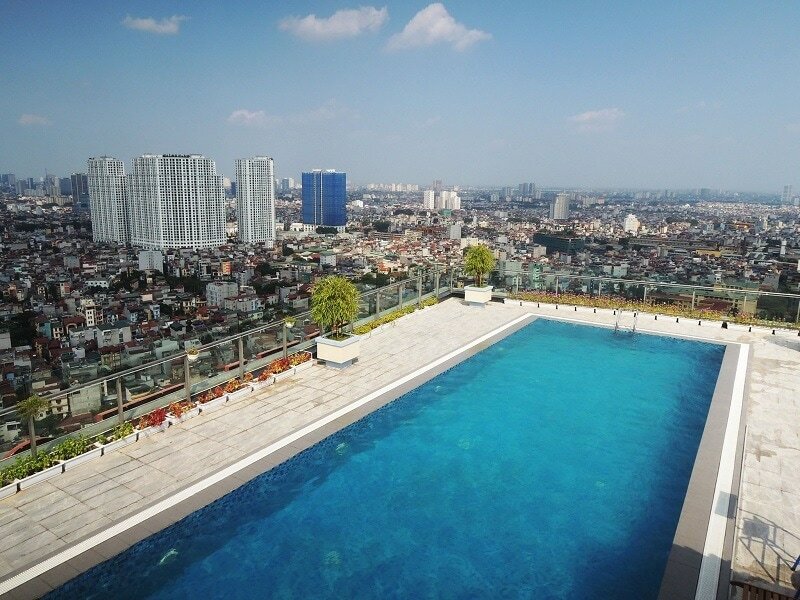 Yes, a friggin’ swimming pool on a rooftop in Hanoi. We threw my friend a surprise birthday party here and the view and experience was amazing. The Rooftop is located on the 19th floor of the Pacific Place building. Pacific Place lies southwest of Hoan Kiem lake. Unfortunately, unlike Summit Lounge, you won’t get any beautiful lake views. But you can still look out over the city and enjoy the chaos. Prices are more affordable than Summit Lounge, as well. Entrees are around 180k VND per dish (~$8.50) and drinks are similarly cheap. The drinks also aren’t as well made as Summit Lounge, though. Top of Hanoi is by far the tallest rooftop bar in Hanoi. It’s located at the top of the Lotte Tower, which is the second tallest building in Hanoi at 65 floors. Prepare yourself for high prices and absolutely stunning views of the city…if it’s a clear day. On a cloudy day, you won’t see anything. Cocktails cost about 190k VND ($9). Not horrible, but expensive for Vietnam. MK Premier Hotel’s roof isn’t super high, but it’s located right in the heart of the old quarter which is why I love it. If you’re staying in the old quarter, you can easily walk to it and enjoy views over the chaos below. Drinks are cheap for how good the view is. If I recall correctly, domestic beers only cost about 40k VND (less than $2). Just walk through the hotel lobby and head to the elevators to get to the rooftop. Ok, this one is more of a cafe than a bar. But they do have alcohol (and good coffee), and they have one of my favorite rooftop views in Hanoi. Serein looks out over the famous Long Bien Bridge. And when a train rolls through, you get to see it chug across the bridge and the river. I love the view from this one – and if you come here, you may well see me working from my laptop with my headphones on. This place is right by my apartment (you can actually see my apartment in this picture! ), so I’m a regular here on sunny days. I’ll add new rooftop bars as I find them, but for now, these are the best I’ve found in Hanoi. Enjoy! And if you have any questions, leave me a comment and I’ll try to help out. Great thanks this helps so much. 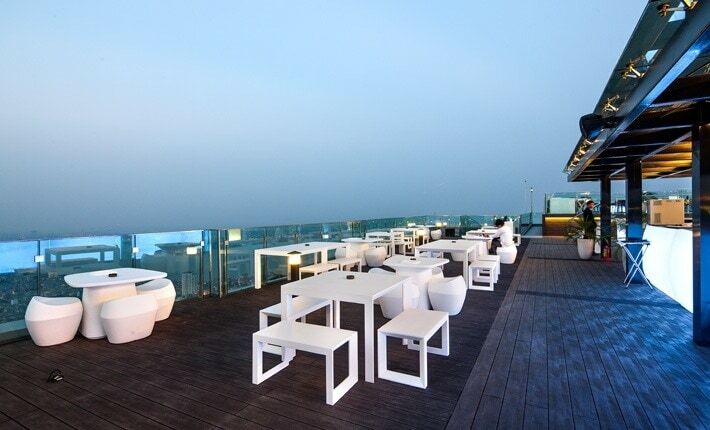 I can also recommend the skylounge at the Tirant Hotel on the 10th level in the Old Quater. Thanks for the tip! I’ve never been there but I’ll have to go check it out some time. Apparently Trill Rooftop Cafe has closed (according to Google), and if I could make a suggestion I’d add the Rooftop (going there now). Just had a look at their facebook page. Seems they closed at the beginning of September for some major renovations. Hopefully it’s back soon as it’s a cool spot. Wish we knew but trill cafe no longer serves food, just desserts. It’s a long way to go for that, so just bear that in mind. 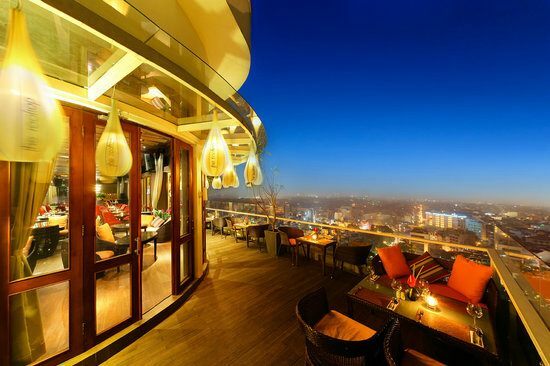 It is a pity if you did not mention Twilight Sky Bar at No.1 Cau Go, Hanoi Old Quarter. Terrific food and cocktail with amazing service and great Hoan Kiem lake view. So awesome! You should try. Thanks excited. I’m heading for Hanoi in December. And that list gives me a week if fun nights. I live the swimming pool idea. But I think it’s cold in December there. I’ll recommend Blue Cocktails and Dreams on the rooftop of Hai Bay Hotel at 27 Hang Bong,Hanoi. The “all blue” bar theme makes me impressed and relax with the top view to old quarter street. Add the tirant hotel – Skyview! In Hanoi old quarter, the lighthouse bar at 27 Hang Be stree is in the top with 360 degree view. I'm a 26-year old American living in Hanoi, Vietnam. Join me as I explore the world and share what I find! 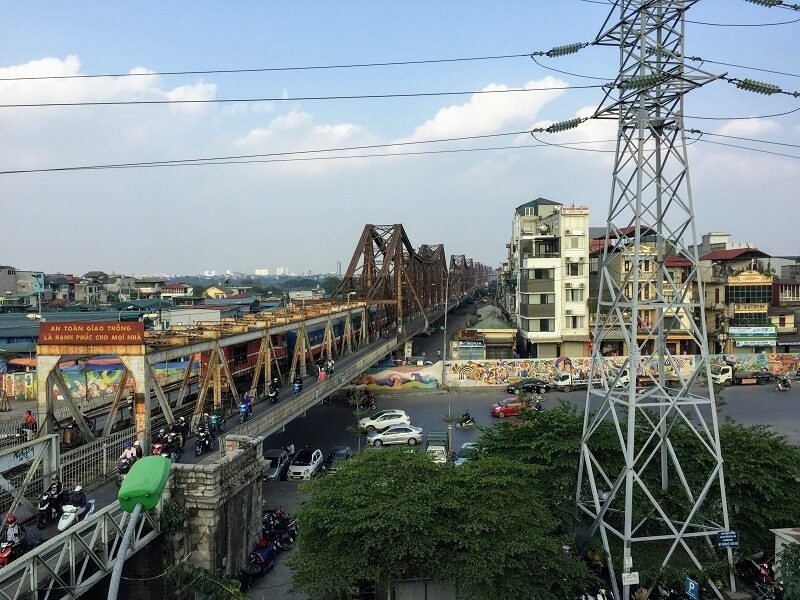 Cost of Living in Vietnam: How Much Does it Cost to Live in Hanoi, Vietnam? My name is Colin Newcomer. I'm a location-independent freelancer living in Hanoi, Vietnam. Join me as I explore the world and share my thoughts along the way. ©2019 by Colin Newcomer. Nonstop Newcomer is a participant in the Amazon Services LLC Associates Program, an affiliate advertising program designed to provide a means for sites to earn advertising fees by advertising and linking to amazon.com.